Outgoing Chief Justice Georgina Theodora Wood has been appointed by President Nana Addo Dankwa Akufo Addo as a member of the Council of State. This is in accordance with Article 89(2)(a)(i) which mandates the President to nominate a former Chief Justice as a member of the advisory body. The Speaker of Parliament, Professor Aaron Mike Oquaye, read a communication from the Presidency to that effect on Thursday, 8 June 2017. Mrs Wood would be joining the other members who were sworn into office on Monday 27 February without her since she was at the time a serving Chief Justice. The Council of State is enjoined by Article 89 of Ghana’s 1992 Constitution to counsel the President in the performance of his functions. The other appointees include Juabenhene Nana Otuo Siriboe II, Sam Okudzeto, Nana Kofi Obiri Egyir II, Stanley Adjiri Blankson, Mrs Alberta Cudjoe, Alhaji Aminu Amadu, Dr Margaret Amoakohene, Alhaji Sahanun Moqtar, Mrs Georgina Kusi, Alhaji Sule Yiremiah, and Mr Paa Kofi Ansong. The rest, in accordance with Article 89(2)(a)(ii) and (iii) are General J.B. Danquah, a former Chief of Defence Staff of the Armed Forces, and Nana Owusu Nsiah, a former Inspector General of Police, to the Council. The President of the National House of Chiefs, Togbe Afede XIV, is an ex-officio member of the Council in furtherance of Article 89(2)(b). Meanwhile, Mrs Wood has expressed gratitude to all her staff for their assistance throughout her period of work in the judiciary as she retires today, Thursday, 8 June 2017. At a ceremony held in her honour which coincided with her 70th birthday, Mrs Wood said her staff kept her going throughout her 47 years in the judiciary. “Each single person sitting here is one of those instruments used by the Lord to keep me going, to keep me trusting in particular, and to keep me faithful. Each one of you added value to my life and I can say proudly on this 70th birthday that you are the people who gave me hope and who helped us to succeed,” she stated. She has also received commendation for her role as the head of the judiciary. A former boss of the Commission on Human Rights and Administrative Justice (CHRAJ), Justice Emile Short, said she performed “creditably” in her 10-year role as head of the judiciary. He commended her for the Justice for All programme she imitated which is intended to reduce the number of remand prisoners in custody by sending judges to the prisons to hold trials for the remand prisoners. 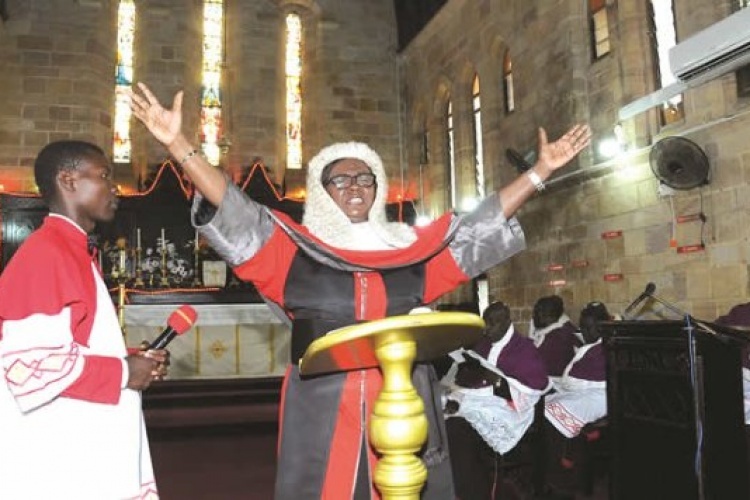 A lawyer and law lecturer at the Ghana Institute of Management and Public Administration (GIMPA), Clara Beeri Kasser-Tee, described outgoing Chief Justice Georgina Theodora Wood as the best the country has ever had. Mrs Wood worked with the Ghana Police Service as a Deputy Superintendent and public prosecutor for three years before joining the Judicial Service as a District Magistrate in 1974. She rose through the Circuit and High courts to become a judge of the Appeal Court in 1991. She was appointed to the Supreme Court by President John Kufuor on 12 November 2002, an appointment she had earlier declined. She was nominated for the position of Chief Justice in May 2007 and on 1 June 2007 parliament approved her nomination by consensus, making her the first woman to head the Judiciary. Since taking office, Mrs Wood has sworn in three Presidents – the late President John Evans Atta Mills in January 2009, then Vice President John Dramani Mahama upon the death of President Mills on 24 July 2012, and President-elect John Dramani Mahama on 7 January, 2013. She last swore into office on 7th January 2017 Nana Addo Dankwa Akufo-Addo.